Think of pain points as problems. Customer pain points are essentially problems your customer is experiencing and it’s your job to resolve them through your offering. 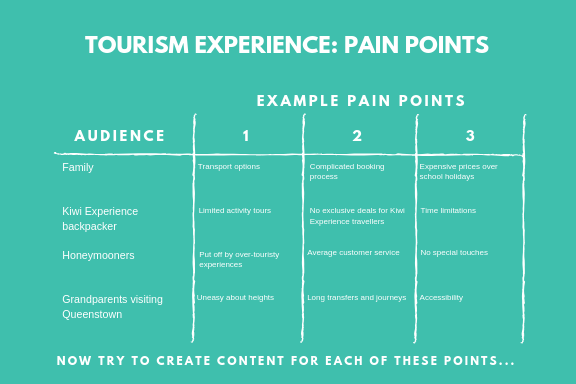 To start, ask for feedback (conduct market research) and map out your customer pain points for each market using our example below and try to feed this into relatable content on your channels. For example, a customer market segment might be scared of heights, so offer insight into adrenaline-fuelled activities to keep their feet on the ground. If you’re talking to families, you could write a blog on five family-friendly activities for your ski holiday in Queenstown with door-to-door transport options. Make sure you’re using readily available data from external bodies such as Destination Queenstown, Tourism New Zealand, Queenstown Chamber of Commerce or Queenstown Airport to help inform your communications. For example, Queenstown Airport has published an International Flight Arrivals Passenger Profile from winter 2018 to help you understand arrivals by market, length of stay and age. A key nugget of information here would be that international visitors’ average length of stay is between four to seven days, which will help inform your content ideas for Tip 4. This data can also be transformed into an easy-to-read and engaging infographic telling your guests when the best time is to visit (ie spring ski) and when to avoid the tourist hordes. A key event that’s always on our radar is Tourism New Zealand’s annual Roadshow, where we gather insightful information on their international tourism strategy and trends in the market. Don’t miss out on the Feb 15 workshop in Queenstown. Offer an insider’s perspective into the daily operations of your business to showcase what makes your business unique. For example, film a mini-documentary of your staff’s favourite après spots in town or use professional imagery to capture your bartenders creating your winter signature cocktail. There’s a good example here from Destination Queenstown which uses locals to help with destination marketing. As a service industry, we’ve found our audience engages well with ‘A day in the life…’ content category, where we use our social media channels to paint a picture of our everyday work lives. Blogs aren’t just for mummy bloggers and social media influencers. They’re one of your most powerful SEO tools. Top tip: if your website doesn’t currently have the capability for a blog or news section, get one! Start by thinking what your audience will Google or ask Siri to find you. For example, if you’re a ski field, people could be looking for road trip essentials for a Queenstown ski holiday or a backcountry guide to the region. How would your blog give them all the answers they need? A seasonal must-do guide is always a good place to start. We love this article by Kamana Lakehouse as it provides value to the reader without being overly pushy with their brand. Try creating your own winter version. We’re lucky to live in one of the most photogenic resort towns in the world – you really have no excuse for boring imagery or video. We have a powerful tool in our pocket so having an expensive camera isn’t a prerequisite for a solid social media account. – Create an image bank that you’ll not only use during the season but for next year’s pre-season winter campaign activity. – Round up your authentic user-generated content! No one tells your story better than a third-party because someone else saying you’re good has huge value. Nominate someone from your team to be your media coordinator, to monitor, gather and save imagery with appropriate image credits. – If you’re a Destination Queenstown member, use their fantastic visual library assets and make the sharing their ‘Welcome to Winter’ mini-feature on your channels. It’s important to remember that good communication doesn’t just happen, it must be planned, developed, and implemented. Head here for our 2019 Communications Strategy Template or get in touch to discuss our content marketing services today.